Orbital ATK's OA-6 Cygnus cargo ship is seen arriving at the International Space Station on Oct. 23, 2016. 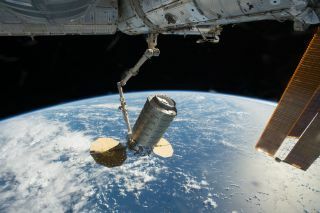 Orbital ATK's next Cygnus cargo delivery mission to the International Space Station for NASA will lift off on March 16, NASA officials said Tuesday (Jan. 10). A United Launch Alliance Atlas V rocket will launch the unmanned Cygnus spacecraft's OA-7 resupply mission from Cape Canaveral Air Force Station in Florida. "Orbital ATK will launch Cygnus atop a United Launch Alliance (ULA) Atlas V rocket for delivery of essential crew supplies, equipment and scientific experiments to astronauts aboard the International Space Station," NASA officials wrote in a statement. "The 30 minute launch window opens at 12:29 a.m. EDT." In November, Orbital ATK announced that this upcoming Cygnus cargo mission would launch on a ULA Atlas V rocket — and not Orbital ATK's own Antares rocket — in order to maximize the amount of supplies delivered to the International Space Station, as well as maintain the company's launch schedule. Future Cygnus flights will launch on Orbital ATK's Antares rockets from the company's launch site on Wallops Island, Virginia. Orbital ATK's OA-7 Cygnus cargo module arrives at NASA's Kennedy Space Center in Cape Canaveral, Florida ahead of its March 16, 2017 launch. Orbital ATK successfly returned its Antares rocket to flight on Oct. 17, nearly two years after a failed Cygnus launch in Oct. 2014. Between that Antares launch failure and the booster's return to flight, the company launched two Cygnus missions on Atlas V rockets, one December 2015 and the other in March 2016. Orbital ATK is one of two private companies (SpaceX is the other) currently flying cargo resupply missions for NASA. OA-7 is the seventh of 10 delivery missions for NASA that Orbital ATK is scheduled to launch under its current contract.